IAMB: A unit or foot of poetry that consists of a lightly stressed syllable followed by a heavily stressed syllable. Some words in English naturally form iambs, such as behold, restore, amuse, arise, awake, return, Noel, support, depict, destroy, inject, inscribe, insist, inspire, unwashed, and so on. A line of poetry written with syllables falling in this pattern of stress are said to be in iambic meter. See extended discussion under meter. Click here to download a PDF handout that contrasts iambs with other types of poetic feet. An iamb is also called an iambus in classical scholarship. IAMBIC: See discussion under meter. IAMBIC PENTAMETER: See discussion under meter. IAMBUS: Another term for an iamb. See above. ICE-BERG THEORY: Hemingway's idea that good writing should consist of simple, direct sentences and plain description on the surface, but beneath that simplicity should be hints of psychological tension or symbolic depth suggested by what is visible above. He told an interviewer, "I always try to write on the principle of the ice-berg. There is seven-eights of it under water for every part that shows." What remains unspoken or unwritten may be as important as what appears in the text. ICTUS (Latin, "blow," or "stroke"): An artificial stress or diacritical accent placed over the top of particular syllables in a line of poetry to indicate which syllables the poet wants the reader to stress if that stress is not clear from the normal pattern of pronunciation. Sometimes, later editors will count the syllables in a line and add an ictus to flesh out the required versification. For instance, if a Shakespearean play has the word banishéd, the ictus over the final -e indicates that the word is probably pronounced as three syllables, with the heavy accent on the final syllable. Some poets like Gerard Manley Hopkins use ictuses (icti) to place an artificial stress on syllables that would not normally be stressed. J. A. Cuddon's Dictionary of Literary Terms (page 439) offers the following example from Hopkins' poem "Spelt from Sibyl's Leaves": "self ín self steepéd and páshed--quite." Here, the preposition in, which would normally be unstressed, is artificially stressed by the poet, as is the -ed in steeped. IDEAL READER: The imaginary audience who would, ideally, understand every phrase, word, and allusion in a literary work, and who would completely understand the literary experience an author presents, and then responds emotionally as the writer wished. IDEOGRAPH: Also called a logograph or ideogram, this is a written symbol system in which a single marking or collection of markings represents not a phonetic sound but rather an entire word or idea. Classical Egyptian, Cuneiform, Mandarin Chinese, and Japanese are ideographic languages. This term is contrasted with a phonetic language, in which a single marking or collection of markings represents a single sound. For instance, contrast the two markings below. Here, we see the Greek word ethos, meaning "character, authority, or charisma." However, the word is spelled out phonetically, with the first marking indicating the /e/ sound, the second marking representing the [th] sound, the next representing an /o/ sound, and the final marking representing the /s/ sound. Similarly, the Latin term for path is via, and it is written out phonetically as three letters, v, i, and a. The markings represent sounds rather than images or ideas. You can find out more about pictographic ideographs by downloading this handout. Keep in mind, modern English is a language with only delusions of being phonetic. In actual point of fact, English contains many silent letters and variations of spelling that no longer represent sounds with the same consistency as a purely phonetic language. To see how far Modern English is from being truly phonetic, read this poem. IDIOLECT: The language or speech pattern unique to one individual at a particular period of his or her life. Because no total conformity in pronunciation is possible, each individual has a slightly different way of pronunciation, a fact that allows computer voice recognition to note unique markers in a person's voice. That uniqueness is part of idiolect, as is each person's unique set of vocabulary and ideosyncrasies of grammar. In terms of discussing linguistics, however, the specifics of idiolect are often not particularly useful, and scholars place much more emphasis on the generalities of dialect. See dialect. IDIOM: In its loosest sense, the word idiom is often used as a synonym for dialect or idiolect. In its more scholarly and narrow sense, an idiom or idiomatic expression refers to a construction or expression in one language that cannot be matched or directly translated word-for-word in another language. For instance, the English expression, "She has a bee in her bonnet," meaning "she is obsessed," cannot be literally translated into another language word for word. It's a non-literal idiomatic expression, akin to "She is green with envy." In the same way, the Spanish phrase, "Me gustan los arboles," is usually translated as, "I like the trees," but if we were to pull the phrase apart and read it word for word, it would make no sense in analytical English (i.e., "To me pleases the trees"). IDOLA (Latin, "idols," singular form idolum): False images of the mind. Francis Bacon's Novum Organum (1620), classifies the primary fallacies in human thinking as four types: idola tribus, specus, fori, et theatri (idols of the tribe, the cave, the market, and the theater). IDYLL: A composition in verse or prose presenting an idealized story of happy innocence. The Idylls of Theocritus (c. 250 BC), for example, is a work that describes the pastoral life of rustic Sicily. Tennyson's poem, Idylls of the King, presents the idealized, poetic account of Camelot's innocent existence before its fall to the forces of barbarism, impurity, and vice. IMAGERY: A common term of variable meaning, imagery includes the "mental pictures" that readers experience with a passage of literature. It signifies all the sensory perceptions referred to in a poem, whether by literal description, allusion, simile, or metaphor. Imagery is not limited to visual imagery; it also includes auditory (sound), tactile (touch), thermal (heat and cold), olfactory (smell), gustatory (taste), and kinesthetic sensation (movement). Cf. imagism, below. IMAGINATION: See discussion under fancy. Likewise, the concrete imagery is clear in Sandburg's opening lines to "Fog": "The fog comes / on little cat feet." Imagism had its heydey slightly before World War I, but the emphasis on strong, concrete imagery appears in other literary periods as well. One could argue that Anglo-Saxon poetry with its emphasis on concrete language rather than abstraction is similar to twentieth-century imagism, for instance. The imagist movement was strongly influenced by the early translations of haiku into English. Cf. haiku, imagery, and concrete diction. IMAGIST: See discussion under imagism, above. IMBAS FORASNAI: In ancient Celtic legends, the prophetic "light of foresight." Several prophetesses in the epic Táin Bó Cuialnge possess this precognitive power, and it functions to drive the narrative plot by predicting or foreshadowing upcoming events. IMITATIVE SOUND: See discussion under onomatopoeia. IMPERFECT ENJOYMENT: Readers commonly associate this motif or poetic genre with 17th-century male poets in France--but it derives ultimately from Latin poetry such as Ovid's Amores 3.7. English examples have been written by the John Wilmot (the Earl of Rochester) and Aphra Behn. Typically, the motif in French literature deals with a proud or arrogant male lover who discovers in the midst of a seduction that (a) he is unable to perform sexually, (b) something unattractive about the woman ruins his desire, or (c) the woman is an incompetent lover and this ends up spoiling their loveplay. Commonly, either the male lover or the poetic speaker blames the woman for this less-than-perfect coition. Aphra Behn, however, puts a unique spin on this perspective in "The Disappointment." In her poem, an omniscient point-of-view allows the reader to see the desires and emotions of the woman (Cloris) in her encounter with a masculine lover (Lysander); the male's inability to perform seems responsible for the woman's frustrated desires instead of the normal French convention for this motif. IMPERFECT FOOT: A metrical foot consisting of a single syllable, either heavily or lightly stressed. See meter, cf. acephalous line. IMPERFECT RHYME: Another term for inexact rhyme or slant rhyme. IMPERSONAL VERB: A verb without a real subject--see "impersonal verb construction," below. IMPERSONAL VERB CONSTRUCTION: A verb used without a subject or with a largely non-referential "it" as the subject. For instance, "It is raining." IMPLIED AUDIENCE: The "you" a writer or poet refers to or implies when creating a dramatic monologue. This implied audience might be (but is not necessarily) the reader of the poem, or it might be the vague outline or suggestion of an extra character who is not described or detailed explicitly in the text itself. Instead, the reader gradually learns who the speaker addresses by garnering clues from the words of the speaker. For instance, Browning's "Porphyria's Lover" and Poe's "The Cask of Amontillado" raise some intriguing questions. To whom are these speakers confessing their murders? Likewise, Browning's "My Last Duchess" contains an implied audience who appears to be a messenger or diplomat sent to make marriage arrangements between the poem's speaker and some unknown young girl. From context, the speaker is taking this messenger on a tour of his castle and showing off portraits and paintings. Likewise, in T. S. Eliot's "The Love Song of J. Alfred Prufrock," the speaker begins by saying, "Let us go then, you and I . . ." The "you" might be the actual reader of the poem, or it might be an implied audience (some unknown dinner companion) accompanying Prufrock, or it might be that the implied audience is the speaker himself; i.e., Prufrock is talking to himself, trying to build up his courage to make a declaration of love. Contrast with audience and ideal reader. This term is often used interchangeably with internal audience. IMPRIMATUR (Latin, "let it be printed"): An official license or official permission to print or publish a book or pamphlet. In particular, the term refers to a license issued by a censor of the Roman Catholic Church. Such a license is also called a "nihil obstat," ("let nothing stand in the way"), a phrase which often constituted the opening words of such a document. Scholars often use the term loosely to refer to any official blessing to an author that originates from a government, institution, or (in the case of biographies) surviving family members. I-MUTATION: Also called initial mutation, an i-mutation is a change to the initial sound of a word in response to other sounds in the following syllable (or to the sounds of other words appearing later in the sentence). This is a common feature of Celtic languages like Irish and Welsh in which words change not only their ending sounds (such as the singular Irish for "coat," cóta, becoming the plural Irish cótai) but also their beginning sounds, such as Irish mo chóta. Typically, such mutations happen when a preceding word requires the change. In Irish, mo ("my") causes a change called lenition, so mo + cóta becomes mo chóta ("my coat"). A closely related phenomenon is the i-umlaut, the raising of a vowel by assimilation to an i or a y sound in the next syllable. This is common in Germanic languages. For instance, in Old English, the prehistoric word *socyan probably became Anglo-Saxon secan because of i-mutation, and the /k/ sound indicated by the <c> then transformed into the unvoiced alveopalatal affricative, giving us the words beseech instead of beseek, for instance. See also lenition. INCANTATION (Latin, in cantare, "to chant or sing in"): A set of words to be chanted, whispered, sung, or rhymed to bring about a magical effect. A large number of incantations survive in medieval manuscripts in both Latin and Anglo-Saxon, and they served as models for later fantasy writers like C.S. Lewis and J.R.R. Tolkien. Lewis, for instance, has Lucy go through a magic book in The Voyage of the Dawn Treader to find a spell to make invisible things visible, and she accidentally causes Aslan to manifest by doing so. In The Magician's Nephew, the Deplorable Word matches the power of its destruction to the brevity of its phrasing. Tolkien, in contrast, prefers longer rhyming incantations in his work. For instance, in The Lord of the Rings, the barrow-wight has an incantation to charm its victims: "Cold be hand and heart and bone, / and cold be sleep under stone: / never more to wake on stony bed," etc. (141). It takes a longer and more cheerful incantation from Tom Bombadil to undo the charm in subsequent pages. INCITEMENT PASSAGE: A conventional scene in medieval Germanic sagas in which a female character urges one or more male characters to commit acts of violence against a target for her own selfish reasons--such as vengeance or ambition. The female character might play upon the other male character's sense of honor, question his masculinity, or simply lie to him. An example appears in The Nibelungenlied, in which Brünhild moves Gunther and Hagen to violence. A more familiar example for English students outside of medieval Germanic literature might be Lady Macbeth's manipulation of Macbeth in Shakespeare. Cf. Hvot scene. In now outdated linguistic classification, incorporative languages were thought to be more "advanced" than isolating or agglutinative languages but less "advanced" than inflected languages like Latin (Algeo 58). The Eskimo tongue commonly known as West Greenlandic is an example of an incorporative language. INCUBUS: See discussion under succubus. INDARBA (Old Irish, "banishment"): A traditional motif of banishment or exile in Celtic literature in which the hero is (often unjustly) exiled from his homeland or tribe or falsely imprisoned. INDEX: In common parlance, an index is a collection of topics, names, or chapter subjects arranged by alphabetical order in the back of a book. Each entry lists behind it the page numbers where that topic, name, or chapter subject can be found within the body of the text. In historical parlance, the term The Index refers to the Inquisition's list of banned works and authors, the Index Librorum Prohibitorum. The Catholic Church issued these bans to repress or silence heretical, obscene or "unchristian" materials, preventing their open publication through the 1500s. See also censorship. INDO-EUROPEAN: The hypothetically reconstructed language that was the ancient ancestor of most European, Middle-Eastern, and Indian languages, including English. Some scholars prefer to use the noun-term proto-Indo-European to refer to this hypothetical language and use the adjective Indo-European in reference to those languages that descend from proto-Indo-European. Click here for extended information. INDO-GERMANIC: Also called Indo-Aryan, this is an obsolete term for Indo-European. INDO-IRANIAN: The branch of Indo-European that includes Persian and Indic. INDUCTION: The logical assumption or process of assuming that what is true for a single specimen or example is also true for other specimens or examples of the same type. For instance, if a geologist found a type of stone called adamantium, and he discovered that it was very hard and durable, he could assume through induction that other stones of adamantium are also very hard and durable. The danger in such an assertion is the risk of hasty generalization. This process is the opposite of deduction. Induction fashions a large, general rule from a specific example. Deduction determines the truth about specific examples using a large general rule. See deduction, logic, and logical fallacies, and syllogism handouts. My permanent or impermanent images. Inexact rhyme has also been used for splendid intentional effect in poems such as Philip Larkins' "Toads" and "Toads Revisited," and has been increasingly popular with postmodern British poets after World War II. Contrast with eye-rhyme, family rhyme, assonance, consonance, and exact rhyme. INFANT DAMNATION: A rather grim Protestant doctrine associated with Puritan theologian John Calvin. It is closely associated with the doctrines of "Total Depravity," "Original Sin," and "The Elect." The idea of Infant Damnation is that, since all humans suffer from original sin and share in the guilt of their primordial ancestors, Adam and Eve, even newborn infants are evil and wicked rather than truly innocent. Accordingly, all fetuses that die in the womb and all infants and children who die in their youth before achieving the age of reason will face punishment for Adam and Eve's sin in the afterlife. This contrasts with the Catholic doctrines developed by Saint Augustine, which stated a child who was baptised before the age of reason by having water sprinkled on his or her forehead would receive an invisible mark of salvation, and if the child died before adulthood, he or she would be welcomed into heaven. Thus, in the medieval poem Pearl, we find the narrator's daughter has died as a toddler, but she is now the Bride of Christ. Likewise, in the Arthurian legends, we read of the giant cannibal that lives on a Swiftian diet of babies, but he insists that each child be baptised before he consumes the babe. Calvin would refute such a Catholic soteriology, stressing through the doctrine of infant damnation that the child can only be saved by repentence and understanding of Christ's sacrifice. INFIX: While a prefix is a meaningful syllable or collection of syllables inserted before a main word, and a suffix is a meaningful syllable or collection of syllables added to the end of a main word, an infix is a meaningful syllable splitting in half a larger word. For instance, in the word replay, re- is a prefix added to play. In the word singer, -er is a suffix added to sing. In many languages, infixes are actually added in the middle of the word rather than the front or end alone. The act of inserting infixes is called infixation. Infixation is rare in English except for humorous or colloquial effects. See infixation for examples. INFIXATION: Also called epenthesis, infixation is placing an infix (a new syllable, a word, or similar phonetic addition) in the middle of a larger word. Some languages regularly use infixation as a part of their standard grammar. In English, infixation is often used in colloquialisms or for poetic effect. Shakespeare might write, "A visitating spirit came last night" to highlight the unnatural status of the visit. More prosaically, Ned Flanders from The Simpsons might say, "Gosh-diddly-darn-it, Homer." Catherine Faber responded to an ambiguous question with an ambiguous answer by crying out, "Abso-kind-of-lutely." The resulting word is often a neologism. INFLECTED: An inflective or inflected language is one like Latin, German, or Anglo-Saxon, in which special endings called declensions appear on the end of noun-stems to indicate case. Contrast with analytic and agglutinative languages. INFLECTED INFINITIVE: In Old English, an infinitive with declension endings attached and used as a noun--a source of much frustration to graduate students trying to translate Anglo-Saxon texts. INFLECTION (also spelled inflexion): The alteration of a word to provide additional grammatical information about it--such as a grammatical ending added to a word to mark its case, tense, number, gender, and so on. Inflections of verbs are called conjugations. Inflections of nouns and other parts of speech to show grammatical case are called declensions. INFLECTIVE: An inflective or inflected language is one like Latin, German, or Anglo-Saxon, in which special endings called declensions appear on the end of noun-stems to indicate case. Contrast with analytic and agglutinative languages. INFORMANT: In folklore studies, anthropology, and linguistics, an informant is the local individual who tells the folklorist a folktale, explains a custom to an anthropologist, or who responds to an interview or dialect study made by a linguist, i.e., a "local source." INHABITED INITIAL: See discussion under initial, below. INITIAL: An enlarged, decorated letter at the beginning of a story, chapter, poem, or section of text in a medieval manuscript. This is also called an initial letter. Initials may be inhabited (having a small creature, animal, or person depicted inside the letter without obvious connection to the text's contents), historiated (having an illustration of a scene or event that clearly connects with the story or subject-matter described in the text), or decorated (having elaborate abstract designs unrelated to the text). See cadel. INITIALISM: Any word, whether an acronym or an alphabetism, formed from the first letters of other words. See discussion under acronym for more information. INITIAL LETTER: Another term for an initial. See above. NB: Gallnuts aren’t actually nuts. They are swellings that form in the bark of an oak tree after it has been stung by an insect laying its eggs. The black seepage from this swellings forms the primary ingredient in medieval manuscript ink in Western Europe, though in some Mediterranean regions, squid ink was used. In poorer monasteries, ash diluted in water might be used as a cheap substitute. Among all other lessons this should first be learned, that wee never affect any straunge ynkehorne termes, but to speake as is commonly received: neither seeking to be over fine or yet living over-carelesse, using our speeche as most men doe, and ordering our wittes as the fewest have done. Some seeke so far for outlandish English, that they forget altogether their mothers language. And I dare sweare this, if some of their mothers were alive, thei were not able to tell what they say: and yet these fine English clerkes will say, they speake in their mother tongue, if a man should charge them for counterfeiting the Kings English. Michael Quinion lists some examples in a web article examples such as follows: anacephalize, adnichilate, eximious, exolete, illecebrous, ingent, and obtestate. INKLINGS: A group of literary-minded scholars and friends at Oxford, largely centered around C.S. Lewis and J.R.R. Tolkien, who gathered informally and socially to read to each other their writings. Sometimes, they met at local bars such as "The Eagle and Child" (known colloquially as "The Bird and Baby);" or when convenient, they met in empty rooms in Magdalen college. Their members would take turns reading aloud their scholarly and artistic works in progress before they submitted them publication, while the other members listened and gave reviews (often caustic, pulling no punches!) to their fellows. The Inklings group formed from the remains of a similar club called "The Cave" which met up through the early 1930s, and overlapped somewhat with J.R.R. Tolkien's Kolbítar (a group of Oxfordians who gathered to read the Eddas and sages in Old Norse for fun). fa , but However, when C.S. Lewis' brother could no longer make meetings of the Cave, Lewis largely high-jacked the members of that organization to form the Inklings as a replacement or competitor. The Inklings met regularly from 1933-1949, and their members included Charles Williams, Owen Barfield, Adam Fox, Warren Lewis, (C.S. 's brother), Colin Hardie, Warren Lewis, Christopher Tolkien (J.R.R. 's son), Hugo Dyson, and a number of prominent medievalists such as J.A.W. Bennett, Nevill Coghill, and Charles Wren. INLAND SOUTHERN: A subdialect of southern. More information: TBA. INNER RING: In his memorial lecture at King's Cross College, London, C. S. Lewis used the term "Inner Ring" for a subtle type of cronyism and peer pressure, i.e., for groups of individuals who gather together not out of affection or friendship or common interest, but out of a desire to be part of an informal elite. He felt that such social gatherings formed when members desired a sense of secret superiority and subtle exclusion. In general C.S. Lewis distrusted cliques for utilitarian purposes in which members hope to use their connections to each other to advance themselves in some way. What modern individuals see as beneficial (or at least harmless) networking, Lewis suggests often leads to moral corruption as one compromised his or her beliefs to be part of the group. He contrasts this with Aristotle's ideas of friendship as a virtue when it formed naturally around shared work, shared interests, or shared habits of mind. INORGANIC -E: A spoken -e added to the end of certain Middle English words that, historically, should not be there. Many Middle English words had their final -e's pronounced before the Great Vowel Shift, but others artificially gained the extra unaccented syllable by faulty linguistic analogy. See also scribal -e.
INSULAR HAND: See insular script, below. INSULAR SCRIPT (From Latin insula, island): Also called insular hand, this term refers to a compact style of handwriting invented by Irish monks. An example appears here. 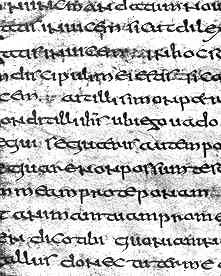 From Ireland, the insular script spread through Britain, where it became the most common script used by the Anglo-Saxon monks. INTENSIFIER: A word such as very that strengthens or intensifies the word it modifies. because even if a literary critic can pin down the author's intention, that does not necessarily mean the author successfully achieved that goal--the literary work may produce a very different effect than what the author wanted. For instance, many readers see the character of Aslan in the Chronicles of Narnia as an allegorical representation of Christ. Lewis claimed that was not his intention. Instead, he wanted to imagine what a being like Christ would be like if it were incarnated not in a human body but an animal body. The question then becomes, should we limit critical interpretation to what Lewis intended to do (or at least stated he intended to do)? Or would it be valid to expand our interpretive horizons beyond those stated goals? New Critics would argue that claiming that the only valid way to read a literary work is according to the author's stated intentions is actually an error or fallacy in interpretation--hence the term intentional fallacy. See also the closely related biographical fallacy. INTERACTIVE NOVEL: A "choose-your-own-adventure" style novel in which the reader has the option to choose what will happen next, creating a different possible series of events or endings for the narrative. Often this means a single reader might read the same book several times, each time experiencing a different plotline. Alternatively, different readers might experience different stories when reading the same book and making different choices. A recent type of interactive novel has been the experimental hypertext novel. INTERLACE: Not to be confused with interlaced rhyme (below), some Anglo-Saxon scholars use the word interlace as a way to compare the formulaic repetitions of some lines in Beowulf with the repetition of linear patterns found in both Anglo-Saxon artwork and in Celtic knotwork such as The Book of Kells. The idea is that, just as the visual motifs in the artwork repeat and interweave with one another, certain lines in the Anglo-Saxon poem repeat and interweave with the narrative material. In the excerpt above, the words in red are part of the interlaced rhyme, and the words in green are regular rhyme. Interlaced rhyme is also called crossed rhyme. Contrast with internal rhyme, below. Pineapple rock, lemon platt, butter scotch. A sugar-sticky girl shoveling scoopfuls of creams for a christian brother. Some school great. Bad for their tummies. Lozenge and comfit manufacturer to His Majesty the King. God. Save. Our. Sitting on his throne, sucking red jujubes white. Contrast with stream of consciousness and dramatic monologue. INTERNAL AUDIENCE: An imaginary listener(s) or audience to whom a character speaks in a poem or story. For example, the duke speaking in Browning's "My Last Duchess" appears to be addressing the reader as if the reader were an individual walking with him through his estate admiring a piece of art. There are suggestions that this listener, whom the duke addresses, might be an ambassador or diplomat sent to arrange a marriage between the widower duke and a young girl of noble birth. This term is often used interchangeably with implied audience. In the excerpt above, the word laugh is an internal rhyme with cenotaph, and the word womb is an internal rhyme with tomb. Other examples include the Mother Goose rhyme, "Mary, Mary, quite contrary," or Coleridge's Ancient Mariner, ("We were the first that ever burst / Into that silent sea"). Contrast with interlaced rhyme, above. INTONATION: Patterns of pitch in sentences. INTRANSITIVE: An intransitive verb is a verb that does not have a direct object (and often one that by its very nature cannot take such an object at all). See discussion under transitive. INTRA-TEXTUAL MEANING: Meaning that originates not within a work itself, but that originates in a related work in the same collection. For instance, in William Blake's Songs of Innocence, Songs of Experience, we find a poem called "The Lamb" and a second poem called "The Tiger." Each poem can be read by itself and makes perfect sense in isolation. However, when we encounter them both within the larger collection, they echo ideas found in each other. The simplicity of imagery, innocent repetition, and child-like diction in "The Lamb" serve as a sharp foil to the fear, doubt, and theological unease of "The Tiger." When the poetic speaker in "The Tiger" asks, "Did He who made the Lamb make Thee?" the reference invokes a deeper meaning by harkening outside "The Tiger" itself to the meaning of the earlier poem, "The Lamb," in which the speaker explains to the lamb that God made it. The effect is to make the reader wonder how the kind and benevolent deity of "The Lamb," the sort of God that creates innocent children and puppies, can be the same deity that creates cruel, destructive forces in nature such as the tiger, a beast which seems to thrive on pain and fear. We see similar signs of intra-textual meaning in The Canterbury Tales, in which the various pilgrims tales seem to "bounce off" each other, echoing the themes, phrasing, concerns, and ideas of previous storytellers. For instance, "The Wife of Bath's Prologue" raises the question of what makes a happy marriage. Later tales, such as the Clerk's, the Franklin's, and the Merchant's tales, will take up the same idea. Each one's final assertion about the nature of marriage is enriched and complicated by the ideas that appear in the earlier tales, even if the later pilgrims make no direct reference to them. The overall meaning originates not in one single pilgrim's pronouncement, but rather between or amongst the various statements made by other pilgrims. INTRIGUE PLOT: The dramatic representation of how two young lovers, often with the assistance of a maidservant, friend, or soubrette, foil the blocking agent represented by a parent, priest, or guardian. INTRUSION: In linguistics, the introduction of a sound into a word that, historically, should not have such a sound in that spot. See also intrusive r and intrusive schwa for examples immediately below. INTRUSIVE R: A type of linguistic intrusion in which the letter [r] appears in an etymologically unexpected location, such as as between two words in which one ends in a vowel and the next word begins in a vowel. For instance, Algeo notes that many dialects insert an [r] in this manner: "Cuba[r] is south of Florida" (321). See intrusion. INTRUSIVE SCHWA: In linguistics, the addition of a schwa sound where historically it has no etymological basis. For instance, Algeo notes that some dialects add a schwa sound between the <n> and <r> in the name Henry, pronouncing it as three syllables. Floridan residents create an intrusive schwa between the <s> and <m> in Smyrna when they refer to New Smyrna Beach. The now archaic word alarum is simply alarm with an intrusive schwa. Some linguists call an intrusive schwa a svarabhakti vowel, naming it after the same phenomenon in certain Sanksrit words. Others refer to it as anaptyxis. INVECTIVE: Speech or writing that attacks, insults, or denounces a person, topic, or institution, usually involving negative emotional language. INVENTIO (plural, inventiones from Latin invenire, "to come upon, to discover", cf. Modern English "invention"): in classical rhetoric, inventiones were techniques for brainstorming, for "finding" material to talk about in a speech or to write about in a composition. Click here for more information. INVERSION: Another term for anastrophe. INVOCATION OF THE MUSE: A prayer or address made to the one of the nine muses of Greco-Roman mythology, in which the poet asks for the inspiration, skill, knowledge, or appropriate mood to create a poem worthy of his subject-matter. The invocation of the muse traditionally begins Greco-Roman epics and elegies. See also muses. IPA: The abbreviation for the International Phonetic Alphabet, a series of symbols in which linguists have designed each single written symbol (grapheme) with the goal of reproducing a single, indivisible unit of sound (phoneme). Its purpose is to capture as accurately as possible the way words are actually pronounced, including elements of accent and stress that normal alphabetical systems typically ignore. IRISH LITERARY RENAISSANCE: See discussion under Celtic Revival. IRONY: Cicero referred to irony as "saying one thing and meaning another." Irony comes in many forms. Verbal irony (also called sarcasm) is a trope in which a speaker makes a statement in which its actual meaning differs sharply from the meaning that the words ostensibly express. Often this sort of irony is plainly sarcastic in the eyes of the reader, but the characters listening in the story may not realize the speaker's sarcasm as quickly as the readers do. Dramatic irony (the most important type for literature) involves a situation in a narrative in which the reader knows something about present or future circumstances that the character does not know. In that situation, the character acts in a way we recognize to be grossly inappropriate to the actual circumstances, or the character expects the opposite of what the reader knows that fate holds in store, or the character anticipates a particular outcome that unfolds itself in an unintentional way. Probably the most famous example of dramatic irony is the situation facing Oedipus in the play Oedipus Rex. Situational irony (also called cosmic irony) is a trope in which accidental events occur that seem oddly appropriate, such as the poetic justice of a pickpocket getting his own pocket picked. However, both the victim and the audience are simultaneously aware of the situation in situational irony--which is not the case in dramatic irony. Probably the most famous example of situational irony is Jonathan Swift's A Modest Proposal, in which Swift "recommends" that English landlords take up the habit of eating Irish babies as a food staple. See also Socratic irony. IRREGULAR VERB: A verb that doesn't follow common verb patterns. For instance, think/thought and be/am/was. Most irregular English verbs today are the remains of the old Anglo-Saxon strong verbs. ISOCOLON: See discussion under parallelism. ISOGLOSS: When linguists create maps showing where dialects are spoken, the isoglosses would be the boundary lines they draw. These isoglosses chart where a particular linguistic feature appears or does not appear. For instance, the use of the second person plural "y'all" might be mapped in the American south, and the second person plural "youse" might be mapped around the Bronx and New Jersey. These dialect boundaries would be different isoglosses on the map. ISOLATING LANGUAGE: In now obsolete language studies, linguists used the label "isolating" to refer to a language with words that tend not to vary--i.e., one in which each idea tends to be expressed by a single monosyllabic word and compounding is rare or nonexistent. European scholars in the eighteenth and early nineteenth century often held up Chinese as a sample isolating language and classified it as a "primitive" or "undeveloped language," but further study indicated that Mandarin Chinese was actually quite ancient, and in fact, originally had been much more polysyllabic. This discovery demolished the simplistic model of agglutinative linguistic development current in older centuries. ITALIAN SONNET: Another term for a Petrarchan sonnet. See discussion under sonnet. ITALICS: A style of printing in which the tops of letters and punctuation marks gently slope to the right. Italics are often used by typesetters to indicate greater emphasis for a word or phrase. Other typesetters use italics to differentiate between various types of material. Foreign phrases such as Latin, French, and Spanish expressions are often placed in italic fonts to differentiate them from the rest of the sentence in English. Linguists and grammarians also use italics to indicate that a word or term is being discussed as a word per se. Finally, it is conventional to italicize or underline the titles of various long literary and major artistic works. You can click here for extended discussion of these conventions. Note that in handwritten documents in which italics are not clearly visible, it is preferable to indicate the italics by underlining the word. Many editors and publishers also call for underlining in any document presented for publication, and the typesetters ultimately will convert the underlined words to italics in the final published version. This policy does lead to complications with HTML text, in which an underlined word or phrase normally indicates a hyperlink rather than a title. Aldus Manutius the Elder (1450-1515 CE) invented the italic typeface. ITALO-CELTIC: Together, the Italic and Celtic branches of Indo-European are called Italo-Celtic; the two groups share many general linguistic traits but are still too different to be considered a single branch. IVORY TOWER: A derogatory term for a place, situation, or philosophical outlook that ignores or overlooks practical, worldly affairs. A French literary critic named Sainte-Beuve coined the phrase, and the term has become popular in American vernacular as well. Poets, artists, scholars, teachers, and other intellectuals are often accused of "living in an ivory tower"--i.e., hiding from the real world or putting all their effort into impractical ideals. The term presupposes that art and thinking are irrelevant in the real world and that such foci are unhelpful in achieving real happiness, understanding, or social change.